Once you’ve got KVM installed, Virtual Machine Manager application will be seen in the applications and we’ll find it in our left side Dash. 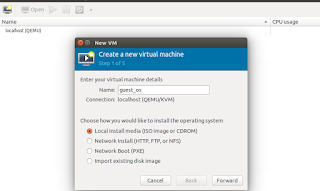 If you dont know, how to install the KVM on Ubuntu, please go through this link. In this article, i will explain you how to create a new virtual machine using KVM on Ubuntu. 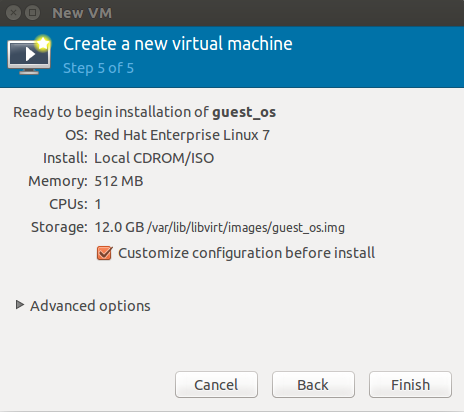 Click the "Create New Virtual Machine" button on the toolbar available at the left top corner and the Virtual Machine Manager will popup the window to create a hardware for our Guest OS. 2. Name the Guest OS and Select the OS Source media. This process is easy if we have used VirtualBox, VMware, or another virtual machine application. You can install through a disc, ISO image, or even a network location. a. Name for your Virtual Machine to identify easily. b. Select "Local Install Media (ISO Image or CDROM)" and click "Forward". c. Select "Use ISO image" and browse for the ISO image of your OS. Choose a type and version from the option available as the image shown below. 3. Configure Memory and CPU for our Guest OS. Specify the Memory size and CPU you require as per our requirement. I give 512MB of memory and 1 CPU, anyway this is only for demo. 4. Create a Disk to store content for our Guest OS. We can create a new disk and we can install a OS on that disk or we can use a existing disk which already has OS and data. Using existing disk will save lot of time and reduce our efforts from installation and configuration. a. 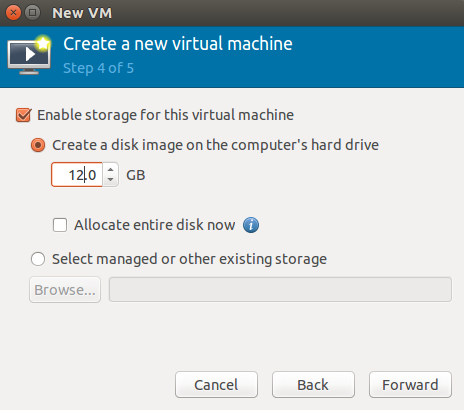 Put tick mark on "Enable storage for this virtual machine" as image shown below. b. select ""create a disk image on the computer's hard drive" and give 12.0 GB (Demo only) as image shown below. To add or modify any hardware configuration, Select "Customize configuration before install" as image shown below and Click Forward. If not, just click finish. 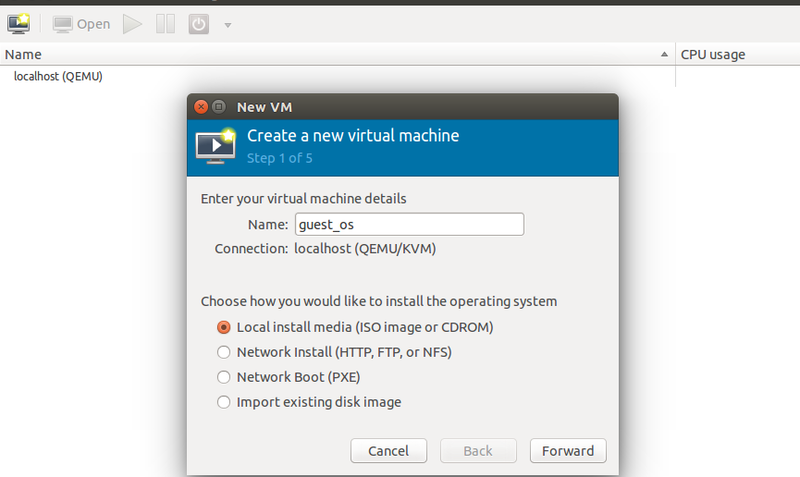 Thats it we are done creating a new virtual machine using KVM on Ubuntu. 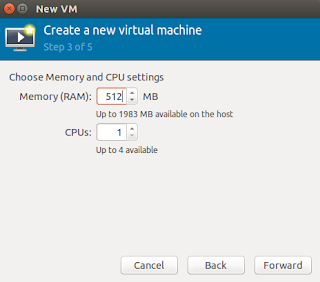 The Virtual Machine Manager window displays a list of your installed virtual machines. Right-click virtual machines in the window to perform actions, including starting, shutting down, cloning, or migrating them. You can view information about the virtual machine and configure its virtual hardware by clicking the i-shaped toolbar icon in the virtual machine’s window. 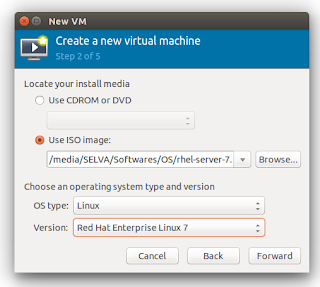 In the next article, I will explain you more about how to install the operating system. Subscribe our youtube channel for video demos and follow us via social networking sites to not miss any updates.